I’ve been home for close to 48 hours and I am still California dreaming. Already counting down the days until I can be back there. Tonight I bring you two more reviews of LA restaurants with gluten free options—Trust me, there will be many more! Remember to always double check with any restaurant that you visit as restaurants may have changed their policy/menu since I visited! Also, since there will be so many restaurants for many of the cities I visit, please check the individual city page located on my page menu bar to see a running list of (reviewed) restaurants. There is a drop down menu to the right of the home page where you can search my reviews by city too! I welcome any suggestions/recommendations. Please let me know if you have any! Wharo Korean BBQ: Located 4029 Lincoln Blvd, Marina Del Rey, CA 90292. Wharo was a tasty gluten free Korean BBQ experience! Ryan and I have visited this place twice so far. 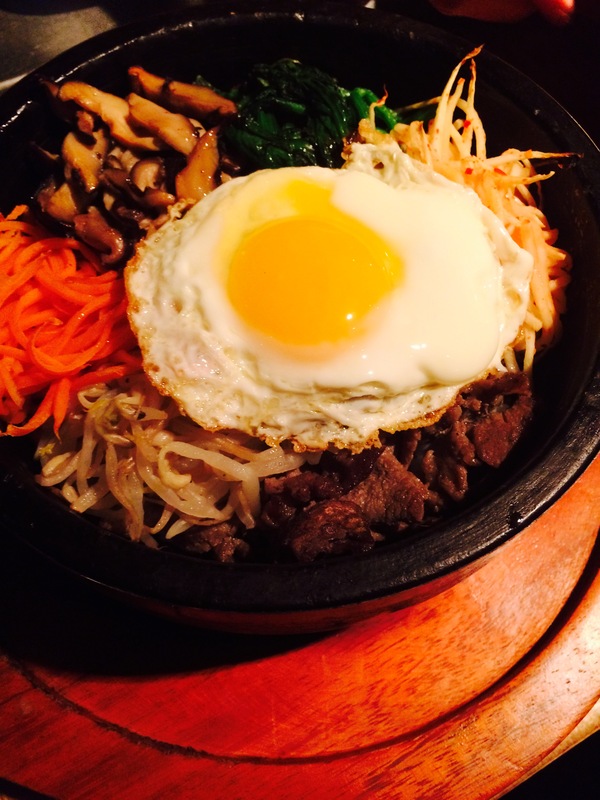 Of course, I ordered my bibimbap (see photo below) both times. The wait staff is very knowledgeable and accommodating of gluten free. However, there can be a bit of a language barrier with the kitchen staff, which can cause confusion as to what is gluten free. The first time I ordered beef bibimbap and the kitchen verified it was gluten free. Whenever I go to a Korean BBQ place, I always order bibimbap since it should be gluten free (fresh veggies, egg, rice) but of course I do always check! I did become sick but I am very weary of chili paste because I am extremely sensitive to chili spice and I developed hives immediately after consuming, a trend that I have seen the past few times I have had any chili paste by accident (I’m thinking a new food allergy…). However, since the restaurant prides itself on having gluten free options and even carries gluten free soy sauce, I tried the restaurant one more time, this time forsaking the chili pasta—I never like to rule out a restaurant based on one isolated incidence especially when there could be a second factor at play (mainly the chili paste). Granted, I do have food poisoning symptoms when I get glutened, I never get hives so I did not believe that I was truly glutened. The second time we visited, I checked every single ingredient with the kitchen who told me that the egg is not gluten free. This did not make sense to me because eggs are indeed gluten free themselves so I asked if they cooked it in soy sauce or any sauce (they said no). To be safe, I requested that they use a freshly (very well) cleaned frying pan to fry my egg separately and they agreed. I also asked for absolutely no chili sauce and they obliged. I am happy to report that I did not get sick so whether it was the egg (which would not make sense unless it was the same surface) or the chili paste the first time (or a combination), I can not say 100%. The staff said that they have many gluten free patrons so they are experienced with gluten free, but if you are not as comfortable about double-checking the menu items, then this may not be the best place. However, I do believe that it was the chili paste that made me ill the first time since I had hives and this happened a separate time when I had chili paste. Like I said, the second time, I had no issues whatsoever. The portion sizes are great and the food is very flavorful! The staff is friendly and service is fast. Fresh Brothers: (http://www.freshbrothers.com/gfree.htm) Located at 4722 Admiralty Way, Marina Del Rey, CA 90292 but has several locations! This is a pizza restaurant that offers takeout and delivery. There is an indoor eating area, but it is small. Service is fast and there are tons of options—even for our gluten free lifestyle! 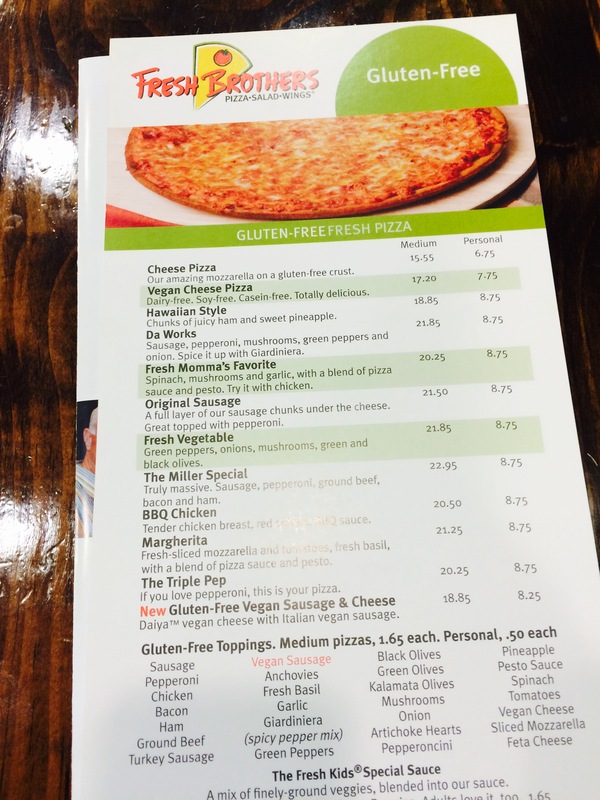 See below for a portion of the gluten free menu. As someone who gets sick with the slightest cross contamination, pizza places always make me worry. However, Fresh Brothers has procedures in place for cross contamination and caters to us with gluten allergies! They take many precautions including preparing all gluten free items in a separate area, using clean fresh gloves, and clean utensils. They try everything to minimize contamination as they target their pizzas for people with allergies so Fresh Brothers really takes allergies seriously! I ordered a BBQ chicken pizza, which was full of flavor and had a nice soft crust. It was delicious! I wish I had saved room because I would have loved to try their gluten free wings!!! Awesome awesome awesome place! I give it 10/10 for a gluten pizza place because 1) SO MANY OPTIONS 2) Takes gluten free allergies/celiac disease seriously 3) Fantastic gluten free pizza! Visit it next time you are in the area…The staff is very willing to accommodate gluten free!